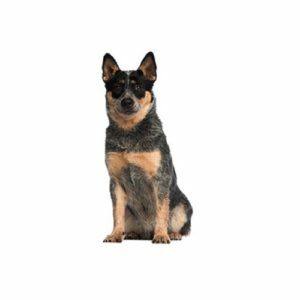 Without peer as a cattle herder, the Australian Cattle Dog (ACD) is ready and willing to work all day. Their agility, strength and courageousness allow them to easily control and move cattle in both open and confined spaces. Stubborn cows don?۪t discourage this dog ??? they just become more determined to get the job done! The breed can be blue or red (can be in mottled or speckled pattern), with or without black, blue or tan markings. In the 1800s, Australians began crossing Dingo-blue merle Collies to Dalmatians and Black and Tan Kelpies. The result was a dog identical in type and build to the Dingo, only with a thicker set and peculiar markings ??? and also an excellent worker. Known originally as the Blue or Australian Heeler, the ACD has been a huge help to the Australian beef industry, enabling farmers to maintain huge herds. Happiest in wide open spaces, ACDs are very high-energy dogs and extremely intelligent, so they need a job ??? such as herding, obedience or agility ??? to keep them happy. While wary of strangers, the breed bonds closely to its family, though the owner must establish themselves as the pack leader. Their smooth, short coat requires only occasional baths and brushing. Herding Group; AKC recognized in 1980. Ranging in size from 17 to 20 inches tall at the shoulder. Love to learn and train. Are you interested in purchasing a Australian Cattle Dog?